There are lots of free software and useful computer applications which consume a lot of memory. Specially, if you are running a game, there is a high possibility that it will lead to the high memory usage (CPU) and eventually after some time you will start receiving “Your computer is low on memory” error. Your computer low on memory issue is quite common if you are using programs like Microsoft Visual Studio or MATLAB etc. Now if you are getting the Your computer is low on memory Windows 10 error then you won’t be able to use other programs which are there on your computer. What you can do at this point is transfer the least used pages from your memory to a new file named pagefile.sys which is hidden. You will find this file in root directory of your system drives and will help you in getting some extra RAM. To restore enough memory for programs to work correctly, save your files and then close or restart all open programs. 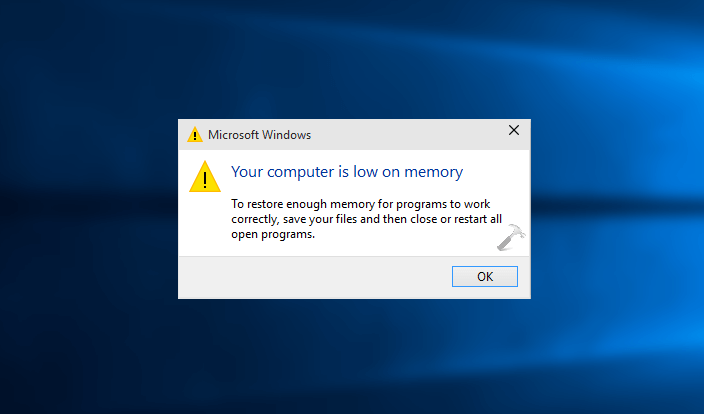 The Windows 10 low memory error which you get is actually your computer is low on memory error. If you are getting this error on a regular basis then the best option which you are having is changing the maximum and minimum file size of the paging system which is present on your computer. The application which is leading to computer low on memory error is eating thrice the resources as compared to other programs which is too much. If you want to find out the application which is leading to Windows low on memory warning then you can get this from task manager. To open Task Manager, press the combination of Ctrl + Shift + Esc keys. Go to Processes tab and look for any applications or programs which are using more than 15% memory. If any program or application is using more than 15% memory then it is leading to the computer low on memory error. Using a Pagefile.sys will perfectly fix your computer is low on memory warning in Windows 10 computer. You can follow the easy steps explained below and find out the best solution to fix Windows 10 low memory error message. How to fix low memory warning in Windows 10? How to fix your computer is low on memory Windows 10 error? Is there any solution for solving low memory computer issue? Windows is running low on memory but I have 16GB RAM, what to do? These are some of the widely searched terms over the internet, and that’s the main reason for us to bringing out this Windows 10 low memory error solving guide. First of all, press the combination of Windows + R keys together to open the Run dialog box. Once Run dialog box is opened, type sysdm.cpl on it and then click on OK button. This command will open “System Properties” of your computer. Once System Properties window of your computer is opened, go to the Advanced tab and click on the Settings option which is available under “Performance” section. 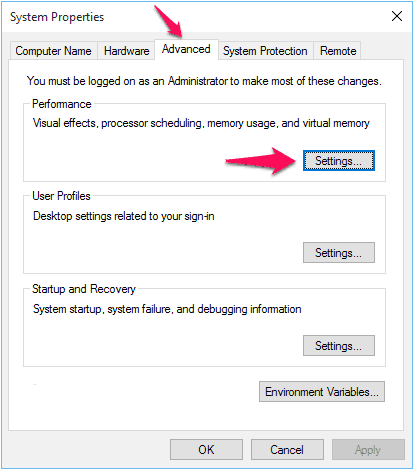 On the “Performance Options” window, go to the Advanced tab and click on the Change button which is located under “Virtual Memory” section. Now you will see Virtual Memory window on your computer screen. Here you have to uncheck “Automatically manage paging file size for all drive” option first. Next, select the system drive and then enter custom fields in “Initial size (MB)” and “Maximum size (MB)” fields. We suggest you not to select “No Paging file” option. Once you have performed all the above-mentioned steps, click on the OK button and then on the Apply button. Congratulations! You have successfully increased the paging file size on your Windows 10 computer. Rebooting computer is not mandatory if you increase the size of the paging file, but if you have decreased the page size then you need to reboot your computer. You might also like to see: Why is My Computer So Slow and How can I Fix it? We hope now you are able to easily fix Your computer is low on memory Windows 10 warning after applying this method. If you are having any doubts or problems regarding Windows computer low on memory error message and preventing low memory problems on Windows 10 computer then let us know using the comments section below. Do you know any other helpful way to fix “Your computer is low on memory” error in Windows 10 PC? thanks , solved a problem, pc works faster, smoother. I had this problem when I was working with Matlab. But it didn’t help:(( the message “your computer is low on memory” still occurs. Could you advise other methods to solve this problem?